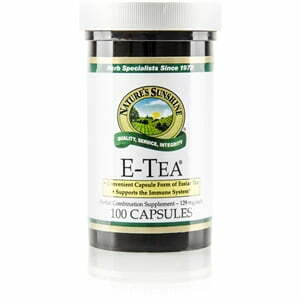 Nature’s Sunshine captures the powerful herbal properties of traditional Essiac Tea in E-Tea® capsules. Essiac tea, from a native Ojibwa medicine man’s recipe and passed to a Canadian nurse, takes hours to produce at home. But the support it provides for the immune system and the circulatory system, as well as its detoxification properties make it a valuable herbal resource. 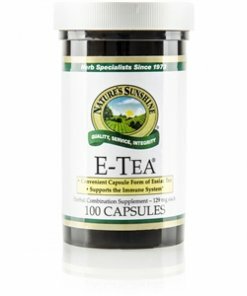 Nature’s Sunshine E-Tea capsules are convenient and provide the same health benefits without the time it takes to make Essiac tea. Instructions: Take two capsules three times daily on an empty stomach. Two capsules equal 2 oz. of the traditional tea. Tea: Add contents of 2 capsules to 4 oz. of hot water. Riceoligodextrin, silicon dioxide (powdered silica), Kosher gelatin and water.